Centre of Mathematics for Applications friend and Abel laureate S. R. “Raghu” Srinivasa Varadhan has recently been awarded the National Medal of Science by United States President Barack Obama. 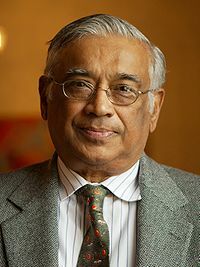 Raghu is Professor of Mathematics and the Frank Jay Gould Professor of Science at the Courant Institute of Mathematical Sciences, New York University. The National Medal of Science is the highest civilian honor awarded by the United States to scientists, engineers, and inventors. Below is a link to the Press Release by the Courant Institute. For those of you who would like to congratulate Professor Varadhan personally, I also provide his email address. A sad final observation is that Raghu and his wife Vasu lost their elder son Gopal, age 32, in the terrorist attacks against the United States on September 11, 2001. He was a Managing Director of Cantor Fitzgerald supervising its interest rate derivatives business in the United States. Gopal was trapped in his 105th floor office above the first crashed plane in the North Tower of the World Trade Center. He was one of the 658 employees of Cantor Fitzgerald — all who were working that day in the Tower — lost that day. This entry was posted in Blog on 12.10.2011 by Paul Carlisle Kettler.